After John McKean of Pittsburgh read the blog entitled "Stacey the Jika Rig King," he wrote an e-mail on Oct. 13, telling the folks on the Finesse News Network about the Doc's Goofy Jig and the swivel jig that Lee Oung of Tampa, Florida, employs for catching pompano. McKean said, " I think Lee Oung and his pals down in Tampa have some finesse tactics that we can use up north in freshwater." Consequently, McKean has been working on a bass-and-panfish version of the Goofy jig and swivel jig. And he employs with spinning outfits spooled with four- and six-pound-test line. He dresses them with a shaved-down, rabbit-hide eel. He noted that he sent some of his freshwater creations to Oung, who reported that McKean's freshwater models work in saltwater, too. McKean says his freshwater renditions of Doc's Goofy Jig and Oung's swivel jig are "more advanced than the fledgling jika rig, and more applicable to guys in the Finesse News Network." In the months to come, we hope to write more about McKean's freshwater renditions of these of these popular saltwater jigs. Below are some photographs and details about the Doc's Goofy Jig, Joe Hebert's Silly Willy Swim Jig and Teaser, Geoff Ehrlichman's Swivel Jigs, Do-It Molds' ear-ball jig, and Lee Oung's swivel jig with a Mickey Mouse face. 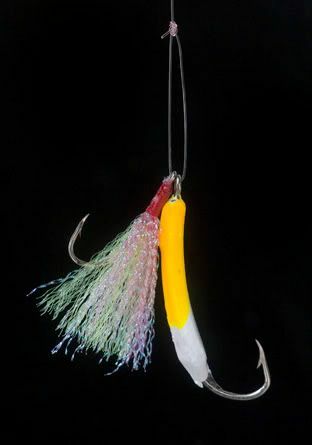 Here are two photographs of Doc's Goofy Jig and teasers. In the top photogrpah, the teasers are attached with split rings. In the second photograph, the Goofy Jig and teaser are attached by a loop knot. Another rendition of Doc's Goofy Jig is the Silly Willy Swim Jig and Teaser, which is made and sold by Joe Hebert of Spring Hill, Florida, and proprietor of Captain Joe Fishing. Here's a photograph of two of Geoff Ehrlichman's Swivel Jigs. Ehrlichman's Swivel Jigs are made in five sizes: 1/4, 3/8, 7/16, 1/2 and 5/8 pounces. Ehrlichman's jigs are too heavy for Midwest finesse anglers, but jika-rig anglers might be interested in experimenting with the Swivel Jig. The head of the Swivel Jig is an ear-ball sinker. The ear-ball sinker and teaser are attached by a swivel. The teasers are made from EP Silky Fiber on a stainless No. 1 Mustad 34007 hook or Tiemco 811S hook. Instead of a teaser, Jika rig anglers can attach an offset, wide-gap hook dressed with a soft-plastic beavertail bait, and they can paint the ear-ball sinker green-pumpkin or brown or other black bass hues. Here's a photograph of Lee Oung's swivel jig or ear-ball jig. Both have Mickey Mouse's face painted on the ear ball. The teaser on the left ball-ear jig is attached with split ring. The one on the right is attached with a swivel.